Senator Mike Lee, Republican of Utah, is a member of the Senate Judiciary Committee, which is charged with evaluating and recommending approval or disapproval of Federal judges – including justices of the Supreme Court of the United States (SCOTUS). In a recent Fox News interview, Sen. Lee spoke for his colleagues on the Republican-majority Judiciary Committee of the Republican-majority Senate by plainly stating that they will not consider any nomination from President Barack Obama to replace the deceased Justice Antonin Scalia. The argument Lee raised is that since Obama is Constitutionally barred from succeeding himself as president, he is a “lame duck,” and the nominee to replace Scalia should be made by the president who will be elected in November and take office in January. While no one disagrees that the Senate may withhold consent from any nominee for SCOTUS that the president may submit, there is controversy over whether the Senate has a Constitutional duty to respond to nominations. That is, can the Senate simply refuse to do the job it is charged with in the second paragraph of Article II, Section 2 of the Constitution until they believe the time is right, even if that takes a year or more? The Constitution says the president “shall nominate, and by and with the Advice and Consent of the Senate…shall appoint…Judges of the Supreme Court….” Nowhere, however, does the Constitution address a timetable or a limitation on deferring Senate action. No doubt a Constitution crisis would result should the president refuse to nominate, or the Senate refuse to consider a nomination, indefinitely. If either side wants to risk such a crisis, they may do so, but the issue would ultimately be resolved by SCOTUS itself, and the only way the Court could enforce its decision would be through something akin to a writ of mandamus (which SCOTUS effectively distanced itself from in Marbury v. Madison). A president who ignored a SCOTUS order to make a nomination could be impeached and removed from office by Congress, but if the situation comes to that, there will be bigger problems facing the country. A recalcitrant Congress, on the other hand, could not be forced to act by anything other than Presidential force – perhaps military intervention – and nobody would accept that. Let us return to the matter of the president as a “lame duck.” In that regard, Sen. Lee and his colleagues have it wrong. Obama is not a lame duck. 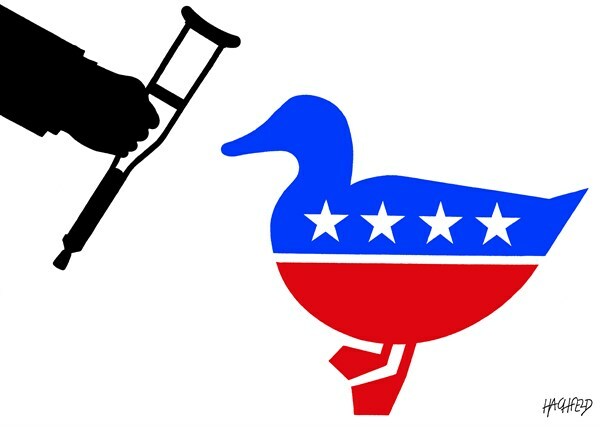 A lame duck is a political office-holder who will be out of that office at the end of the present term, and whose successor has already been selected. The status of a lame duck president exists only after the election of the next president and before his/her inauguration. In other words, the lame duck period will not start until after November 8, 2016, and will end January 20, 2017. If Obama is a lame duck now (since he cannot be re-elected to a third term), then he has been a lame duck since the election of 2012. That is clearly not the case, or else any president elected to a second term would spend over half of his/her presidency as a lame duck. Having established that, we now turn to the 22nd Amendment itself – the one which prohibits Obama from being elected a third time. Even if we disregard the possibility expressed in my recent blog post “Natural Born Citizen,” which outlines the circumstances in which the Constitution is shown to permit an unqualified presidential candidate to run, to win, and to take office, Barack Obama could indeed be president again. The 22nd Amendment has a strange and conflicting history. Some of the Founding Fathers – notably Hamilton – thought unlimited terms would allow a “President for Life,” and that was not a bad thing. Others – Jefferson in particular – thought the Constitution ought to limit the president to two terms. His belief was that a “President for Life” would be no different from a monarch. He was not successful in getting a limitation written into Article II, but Washington’s decision to step down after two terms set a precedent that continued until 1940. Although a few presidents, notably Grant and Theodore Roosevelt, sought to gain third terms, none were successful. Franklin Roosevelt, however, was elected president four times, and died in office shortly after his last inauguration – a “president for life.” Since he was a Democrat, the Republican Party feared the possibility of “another Roosevelt,” and in 1947 Republicans and Southern Democrats who had opposed the New Deal approved the revanchist 22nd Amendment. Within four years the requisite number of States had ratified it. The Amendment, of course, came back to swat the Republican Party with the Law of Unintended Consequences. There have been two presidents since – Eisenhower and Reagan – who were ineligible to run for third terms they certainly could have won, and both were Republicans. There is another aspect to the 22nd Amendment that makes it even more problematic. It does not directly address presidential service, only presidential election. It does not specifically deal with the case of a two-time elected president who is later in a position to succeed to the presidency in the event of the death, resignation, or removal of the sitting president. Imagine if Hillary Clinton were elected president on a ticket with her husband Bill Clinton, who was twice elected president, as the vice-presidential candidate. It could happen, as the Constitution forbids anyone “constitutionally ineligible to the office of President” from becoming Vice-President. Bill Clinton is not specifically barred by the Constitution from being President again, only from being elected President, implying that he could be Vice-President. But they didn’t. They wrote that such a person could not be elected President. The Amendment does not say anything about him/her becoming President by elevation from the Vice-Presidency or by any other conceivable means. The Constitution is like a captured spy. Torture it enough and you can get it to say anything.